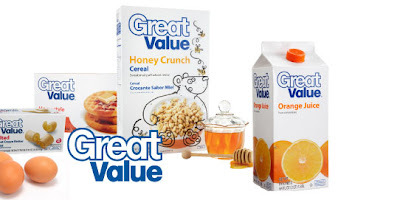 Walmart has revamped its Great Value house brand and they want to know how consumers feel about it. To make your thoughts count, join the Walmart Round Table and participate in surveys that help shape their brand. If you need more of an incentive, you'll have the chance to win one of ten $500 Walmart gift cards every month. We received some Great Value items to sample and overall I was really impressed. I like the clean, bright look and cohesiveness of the new packaging MUCH better than the old versions. More importantly, the food tastes good. Roo and Jasper especially love the Fruit Spins and Twist & Shout Chocolate Sandwich Cookies. If you're more into snarky humor than constructive criticism, you might also want to check out People of Walmart, a photo blog that features reader-submitted pictures snapped of the oddities one sometimes encounters at the nation's superstore… Yikes. AAAHHH! My cousin turned me on to People of Walmart last month, and it's a regular read. I'm always bracing myself for disappointment whenever I click over there, thinking that Walmart has shut it down somehow.